The banking system has played a pivotal role in the economic development of the country. The Indian banking sector comprises of both public and private sector players and is regulated by Reserve Bank of India (RBI). Mobilise Savings Banks encourage people to park their hard earned money with them by providing them rate of interest on the same. These funds are later used for the purpose of investments and development of the country. In a way, it is a win-win situation for both. Financial Inclusion Even in today's time, we have a lot many people who are not aware about the schemes launched.by the government. 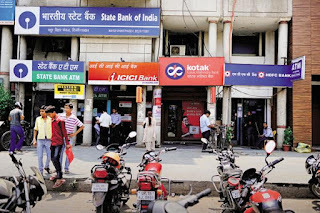 Banks play an important role in financial inclusion by connecting and updating the people with this knowledge. Banking correspondents and representative contribute to the same. Provide Short and Long Term Loans Banks are the most reliable source of undertaking loans for the purpose of business, education etc. Sectoral Development NABARD is the apex bank for the development in country. It takes care of the specific needs of farmers, small and medium enterprises. Exim bank provides funds for exports and imports. RRBs (Regional Rural Banks) cater to the need of rural areas. Resolution of NPAs One of the major challenges of Indian banking industry is the mounting NPAs and stressed assets. The government and banks need to work on decreasing both of them. Cyber Security With India heading towards becoming a cashless economy, the banks need to come up with a robust IT infrastructure to handle the adverse effects of the same. Capital Infusion by the Government With most of the PSBs struggling with their NPAs, capital infusion becomes important in order to maintain their health. The banks need to make proper utilisation of these funds. Cashless Economy With the government launching schemes such as digital India, Indian banking sector is heading towards cashless and paperless economy. The future lies in the mobile wallets and applications. Consolidations of PSBs The Union Government is looking forward to merge PSBs after successful merger of SBI and its associate. This will help in meeting Basel III accord by the country. Robots and Virtual Assistants Some of the private sector banks in the country have launched robots who act as customer care representatives. They have minimal human intervention in their working. Para Banking Services These include insurance business, portfolio management services, to become pension fund managers, mutual funds business, money market mutual funds, underwriting of bonds of PSUs, investment in venture capital funds. Banks can merge, acquire or form JV with other entities to venture into these activities.